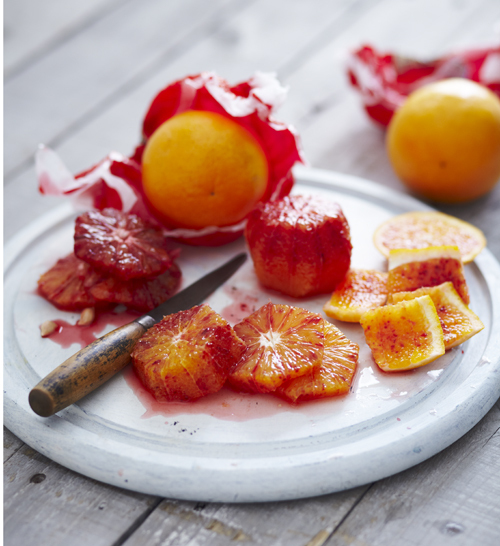 Blood oranges are still awash in street market stalls so here is a little inspiration for your last couple of purchases. Their dramatic speckled orange and red flesh only pops in season once a year from Sicily or Spain, and should be proudly displayed in a composed salad to show their true beauty. I’ve paired them up with palm hearts, which are one of my favorite ingredients for salads. If you’ve never had them before, its sort of a cross between celery and artichoke with a silky soft texture and slightly acidic taste. Just like their name on the tin says, they are truly the inner heart of a young palm tree, mostly grown in Costa Rica and other parts of South America. Supermarkets sell them in the tinned vegetable aisle; so they are by no means difficult to find. Don’t be put off by their bizarre tubular appearance, they are seriously the business. 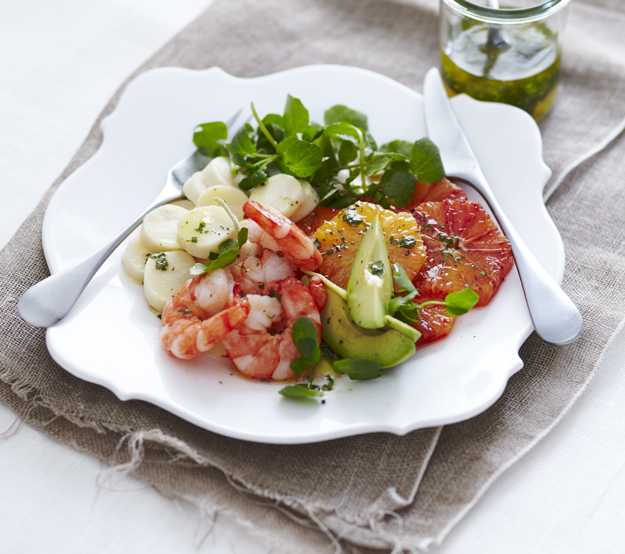 Practically any ingredients pair with them but the best ones are avocado, parmesan, citrus, coriander and seafood. Throw a few cans in your cupboard to knock up an instant starter or glam up a tossed salad. Over the years, I’ve written many recipes with these. Both Meals in Heels and The Well Dressed Salad have a few and this one is from Skinny Meals in Heels. Be sure to make it soon before all of the blood oranges disappear, but navel or other seedless will also do just fine. Use a sharp knife to cut the peel off the oranges and then cut each into 4 lengthways slices. Drain on paper towels. 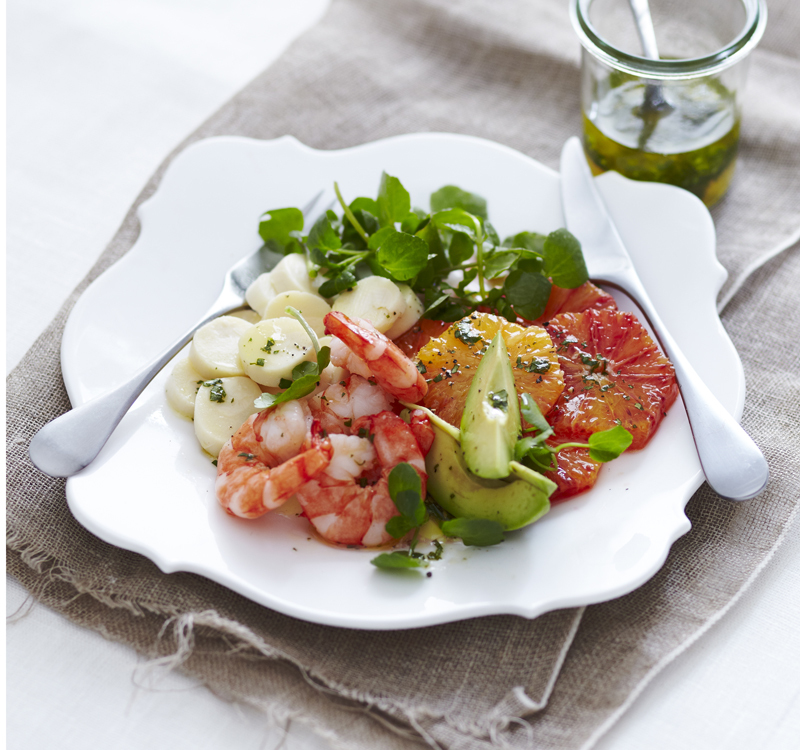 In a large bowl or platter place the watercress, palm hearts, orange, avocado, prawns and onions. In a small glass jar with screwtop lid, add the dressing ingredients. Sprinkle in some salt and pepper and shake well. Pour over just before serving.